The best parts of Only Come Out at Night reveal an ambitious pop band that still delivers the immediate punch of its pop-punk contemporaries. 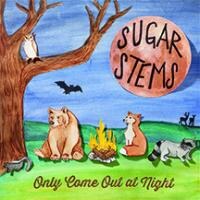 Sugar Stems are another energetic band from up-and-coming label Dirtnap Records, but Only Come Out at Night distances itself from other album's on the label right up front. Where records from Steve Adamyk Band and Sonic Avenues bust up tight pop structures with punk energy, Sugar Stems flips the formula. Opener "Baby Teeth" takes power chords and a slick hook and turns them into something muscular but lush. "Some Might Say" melts at the edges thanks to bittersweet organ work. And, late in the record, songs like "Elm Tree Eulogy" and "Million Miles" stretch out the band's pop sensibility. The former makes for a dynamic, propulsive and arena-sized standout, while the latter is a melancholy acoustic-and-organ coda to the album. In these moments, the band creates a perfect pop landscape for singer Betsy Heibler's rangy and honeyed vocals. The best parts of Only Come Out at Night reveal an ambitious pop band that still delivers the immediate punch of its pop-punk contemporaries. There are other moments, like "I Know Where I'm Going" and "Radio Hearthrob", that feel more like pop-punk by the numbers in comparison to the more carefully textured tunes here, but Sugar Stems show flashes of originality here that show us that this album is the sound of the group just getting started.